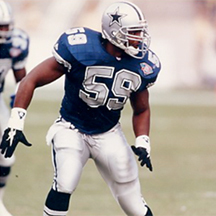 Darrin Andrew Smith (born April 15, 1970 in Miami, Florida) is a former American football linebacker in the National Football League (NFL) who played for the Dallas Cowboys, Philadelphia Eagles, Seattle Seahawks and the New Orleans Saints. While with Dallas he won two Super Bowl rings. At different times in his pro career he has played all three linebacker positions. Smith played college football at the University of Miami where he was also won two national championship. At Miami Norland High School, he played linebacker and was also a 185-pound pulling guard during his junior year. He was also a member of his high school track team were he competed in the 100 meters with a personal best time of 10.7 seconds. He was a member of the Dennis Erickson’s 1989 and 1991 national-championship teams. Smith played strongside linebacker at Miami, where he formed “The Bermuda Triangle” along with teammates Jessie Armstead and Michael Barrow. As a senior, he was a starter in the 1991 national-championship team and was also named an All-America linebacker. In 2006, Smith was inducted into the University of Miami Sports Hall of Fame. His bio can be viewed at UMSportsHallofFame.com. Smith stayed five years at the University of Miami, the first as a red-shirted freshman under Jimmy Johnson, so he could get a complete education. He earned his master’s degree in marketing after getting his undergraduate degree in business management.